The Talk Parkinson's blog is no longer being updated. You can also find us on Twitter or like us on Facebook. For information and support call our confidential helpline 0808 800 0303. 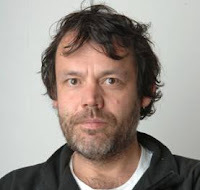 Dr Anton Gartner is a Parkinson's UK funded researcher at the University of Dundee. Anton's research project using C.Elegans worms (PDF, 262KB) inspired us to create Dave the Worm - the newest member of the Parkinson's UK Fundraising team. Anton recently told us a bit more about his groundbreaking research using worms to study Parkinson's. I don't have close relatives or friends affected by Parkinson's but my own mother is affected by another neurodegenerative condition called Multiple Sclerosis. After 30 years with this, she is still doing fine and lives an independent life but has difficulty with walking. She can walk up to 100 meters or so but then she gets tired. I experienced her anxiety in those early days when the first symptoms started to appear. Now I really admire her for moving on, always looking forward and making the very best of her life. She is fond of Dave the Worm and is now one of his international supporters. I first met people with Parkinson's when I was working as a nurse on a hospital ward in Vienna just after obtaining my PhD. At the time in Austria everyone had to complete a year of 'social service' - so it was this or join the army. To begin with I was quite upset about having to leave the lab and not using the skills it hadn't taken so long to learn. But I soon started to enjoy the job and I gained much more than I would have done by staying in the lab for another year. I learned how to deal with people, how to encourage them and how to help where help can be provided. Although it was challenging having to deal with people affected by various and often very serious illnesses, I learned from them to stay optimistic and to enjoy life as much as one can. And I remember many conversations, so much more thoughtful than often done in a lab. I remember the day I met my first patient with Parkinson's very clearly. We were trained to encourage our patients to be as independent as possible; so I encouraged him, as he seemed mobile and independent, to shave himself – something he hadn't done for a while. Sure enough without saying a word he shaved himself, but unfortunately with several cuts. I felt terrible, but he was great, we became friends and it became my job to help him shave. We enjoyed our time. Life is not always about big stories. This Parkinson's Awareness Week (15-21 April) we're asking everyone to put themselves in people with Parkinson's shoes, and like Anton get a better understanding of how the condition affects day to day life. 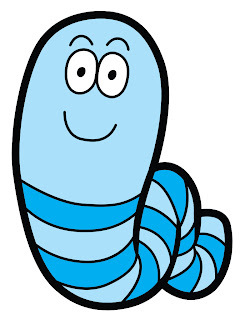 And during the week Dave the Worm will be getting out and about to visit more Parkinson's researchers and find out more about their lives in the lab, so keep an eye on Dave's Facebook and Twitter pages for updates. What can worms teach us about Parkinson's? When did you first start working with worms? I started working with worms in 1997 when I was a postdoctoral researcher in Cold Spring Harbor - a famous lab close to New York. At the time I was using my worms to learn more about how and why cells die. As I write, thousands of the cells that make up my body are dying. But luckily we're all made of billions of cells so most of the time cell death isn't a problem. In fact, too little cell death can lead to cancerous tumours forming – so the right cells dying at the right time is actually vital to staying healthy. Of the thousand cells that make up a worm like Dave, 131 die. And I was one of the first to study how and why cells die in my worms. Have you met Dave the Worm? We now know that our worm cells behave in a very similar way to human cells when it comes to cell death and that many of the same genes are involved. How did you become interested in Parkinson's? My interest in Parkinson's actually started on the staircase at my University. I bumped into my colleague Dario who mentioned that he'd started working on 2 of the genes related to rare inherited forms of Parkinson's. A gene is a short segment of DNA that provides the instructions for making a protein, and proteins are the building blocks our cells are made of and the machines that do the cells work. For scientists the challenge is to work out how these machines work and what they do inside our cells. And that's where our worms come in. The first experiment we tried in our worms was removing the 2 important Parkinson's genes (PINK1 and LRRK2) completely. But to our surprise, without the genes our worms wiggled normally, grew happily and developed no Parkinson's-like problems. Quite a disappointment at the time! By this time I was becoming fascinated with Parkinson's so when I saw that Parkinson's UK were offering research grants to help scientists like me investigate this new and exciting avenue of research I decided to apply for funding to study the condition in my worms. Luckily for me, worms like Dave have the same type of nerve cells that are lost in the brains of people with Parkinson's. But instead of having millions, the worms only have 8 of these vital cells which we can study in action inside the living animals. Working with our worms has already helped us understand more about what happens when these dopamine-producing cells start to die and I'm really hopeful that our work will lead to treatments that slow or stop the progression of Parkinson's. We'll have more to share with you on the blog from Anton this week - so look out for the next installment. The workings of Parliament remain a mystery to most, but the launch of a new inquiry means some people with Parkinson's will soon have the chance to influence politicians face-to-face. Our Parliamentary Advisor, Caroline Weston, has been working hard to help set up the inquiry which will investigate whether NHS Continuing Care – which provides funded care for those with severe health needs – is working for people with Parkinson's. It's my job to try and make sure our politicians are considering the needs of people with Parkinson's – a challenging task to say the least. But we're lucky enough to be able to work with a group of politicians who meet specifically to talk about Parkinson's and the issues around it. ﻿All Party Parliamentary Groups, or APPGs, are informal groups of MPs and peers who meet up to discuss and champion lots of different issues ranging from Parkinson's to Albania to zoos. The APPG on Parkinson's is run by the politicians, but we provide them with information and opportunities to raise awareness of Parkinson's. 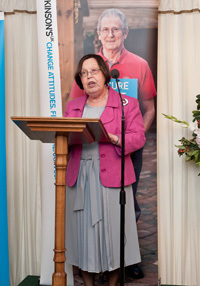 Chaired by Baroness Gale (pictured right), whose father had Parkinson's, the group has more than 40 members and many have their own personal connection to the condition. When we met with the group last year, we told them about how getting access to this care is a real issue for people with Parkinson's – in fact it's the third most common reason that people call our helpline. The APPG agreed that this situation is not acceptable, so they decided to hold an inquiry on the issue for people with Parkinson's, and how to make the current system for providing NHS Continuing Care work better for them. When the inquiry launches next month, we'll be asking people with Parkinson's to tell us about their experiences of NHS Continuing Care and how they think it could be improved. Some people will even have the chance to go to Parliament and talk to the politicians directly. Keep an eye on our website in early March when we'll tell you how you can get involved. So when he received an email from the Parkinson's UK Campaigns Network calling on people with Parkinson's to email their MPs about the welfare reforms, Allan jumped at the chance. I'd heard that the Government - in all its wisdom - planned to make even more cuts to our benefits and I was really worried. People with Parkinson's have a condition that will never improve - I just couldn't see any point in sending us for another awful round of interviews to see if we're entitled to benefits, when our Parkinson's can only get worse. Under the new PIP test, if you can walk more than 20 metres you could well lose your money. But the way I see it is if you can walk 20 metres, you've got to walk 20 metres back - something a lot of us with Parkinson's would find very difficult on a bad day. So when I got an email from Parkinson's UK asking us to write to our MPs I decided I had nothing to lose. I wanted to find out from the horse's mouth exactly what was going on, so I emailed my Labour MP, Julie Hilling. I was quite surprised when Julie's secretary got in touch and wanted to arrange a meeting. I told the committee of the Bolton Branch, and they hired a room for us at the Bolton Arena so other people could come and ask questions too. On the day, there was a really good turnout of about 25 people and the Bolton Evening News even came along to take photos. Julie did a Q&A session with us, talking in-depth about the changes and finding out what it would mean to us if we lost our benefits. The whole thing seemed to have a real impact on her. People have the wrong idea about Parkinson's - they think it's just a tremor but it's so much more than that. That day she met some people who were really poorly with Parkinson's and heard about how it affects them. This prompted her to make a promise that she would follow up on our concerns directly with the relevant Minister. After talking to Julie I felt more secure because she listened to our concerns and explained things as clearly as she could. I really believe we have to take every chance to speak up abut what is wrong with the system or we'll end up letting the politicians walk all over us. I feel so indebted to the people out there helping us like Julie and the people involved with Parkinson's UK. For more information on the benefit changes see parkinsons.org.uk/pip. If you have any concerns or questions, please call the Parkinson's UK helpline 0808 800 0303. 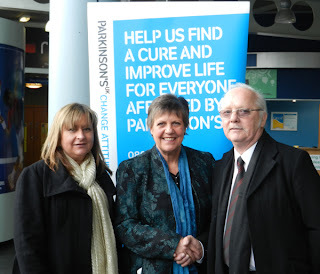 We changed our name from the Parkinson's Disease Society to Parkinson's UK on 8 April 2010. We bring people with Parkinson's, their carers and families together via our network of local groups, our website and free confidential helpline 0808 800 0303. Specialist nurses, our supporters and staff provide information and training on every aspect of Parkinson's.